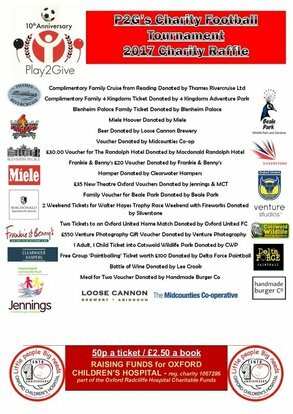 Thank you so much to all the wonderful companies in Oxfordshire and beyond who have so generously donated and supported this year's football tournament by way of the donation of raffle prizes. The kids football tournament on Sunday, July 16th is expected to yet again raise many thousands for the Oxford Children's Hospital - registered charity 1057295. The raffle each year as part of the event is always a winner. Below are the prizes you could win if you buy a ticket - priced at 50p each or £2.50 a book - all proceeds to the children's hospital.